Visceral descriptions and a great story line make for an engaging read. In this book, we get a close and personal look at Levana’s history and why she is who she is when we’re introduced to her in Cinder, Scarlet and Cress. Every scene in this book induced anything and everything from shock to disgust. I was impressed by the author’s ability to evoke/invoke such reactions from me. The pacing of this story was perfect…The author managed to move seamlessly from event to event without too much “telling.” Enough events were fleshed out throughout the book that I would get a feel for the characters but the story never dragged. Despite its short length we actually get to discover a lot about Levana, Channery, Winter and even Luna in this book. We learn about why Levana is obsessed with glamouring herself, how she got her scars and why she hates mirrors so much. We also discover the circumstances behind Princess Selene’s “accident.” There are details about Winter’s childhood and who her real parents are. We also learn about Levana’s messed up childhood and Channery’s influence on her. Most importantly, (if you don’t already know or remember) you get find out why and how the Lunars unleashed Letumosis on the Earth. And of-course there is an excerpt from Winter at the very end! As Cait at Paper Fury said, “This book made me pity and loathe Levana all at once.” Learning the reasons behind Levana’s need to glamour herself made me sympathize with her. The story also started of with her waking from a nightmare and I couldn’t help feeling bad for her…But then I see how she reacts to her parent’s death and I felt so disgusted. Her sister, Channery, was even worse – behaving so flippantly and scheming about running of with a guard during their funeral. However bad Levana had seemed in the previous books, I soon realized her sister Channery is far worse. In some way, her sister’s taunts and treatment of her played a role in transforming her. Channery’s behavior was despicable and contemptible and I hated the way she manipulated Levana like she was just a pawn in some sick game. I was really impressed by how realistically Levana was depicted. Although she is clearly a villain – she is also incredibly vulnerable and feels damaged and ugly. Then there’s the “villainous” side of her…She selfish and doesn’t care who gets hurt as long as she gets what she wants. Her feelings for Evret, a palace guard, were also extremely messed up. She was jealous of his wife and kept entertaining sick fantasies in which he would confess his love for her. The romance between them remained screwed up. Levana kept using her glamour to get inside his head and force her desires on him. And I could understand why she was so desperate to feel loved and wanted by the only man she ever had feelings for – but that still didn’t justify her actions! I really sympathised with Evret in those moments when he realized what Levana was doing to him and tried (unsuccessfully, of-course) to make her understand that what she was doing was wrong. Would I Recommend It? Without a doubt! 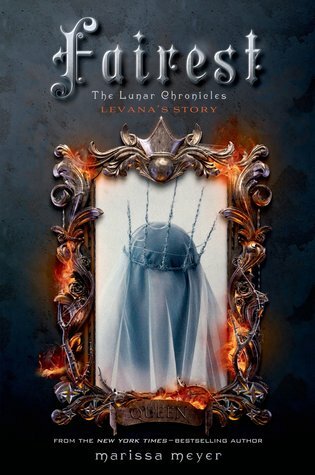 This is an amazing book that you must read (especially if you are a fan of the Lunar Chronicles). Whether it contains spoilers or not is irrelevant because this story will likely be more interesting and relevant to you if you’ve already read the Lunar Chronicles. I just love when stories are about the villain. It really just gives a new perspective on them, like you said that Levana is vulnerable but she is still a villain in the essence. Have to get around to reading Fairest soon! I know right! There are so many book’s describing the “hero’s journey” but few describing the “villain’s journey.” And really its so much more realistic when characters are complex like Levana. Yes, you really should! It’s totally worth your time and money. While I liked this, it wasn’t all I wanted it to be. I really wanted Lavena to be a crazy psychopath and while she’s still crazy, I found her character to be more sympathetic than I wanted her to be. I guess she could have been a crazy pyschopath but by making her character both hatable and pitiable, the author made her story more interesting. Great review! I really enjoyed this one too, and was so surprised to feel a hint of pity for Levana, knowing all the awful things she went through as a child. Not that she’s not fully terrible by adulthood, but at least we finally understand how and why she became that person! The Lunar Chronicles is one of my two favorite series of all time and I absolutely cannot WAIT to get my hands on this and Winter! I’m not sure, but it feels like Levanna’s story is being told prematurely. Like it should’ve been released after she was no longer a threat. I wonder how reading this will change my view on her in Winter. Who knows, maybe that will actually make Winter all the better. Yes, I know right! I’m really excited!! I never thought of it that way but like you said, maybe this will make Winter better because we have some context for the decisions she has made (and will make).